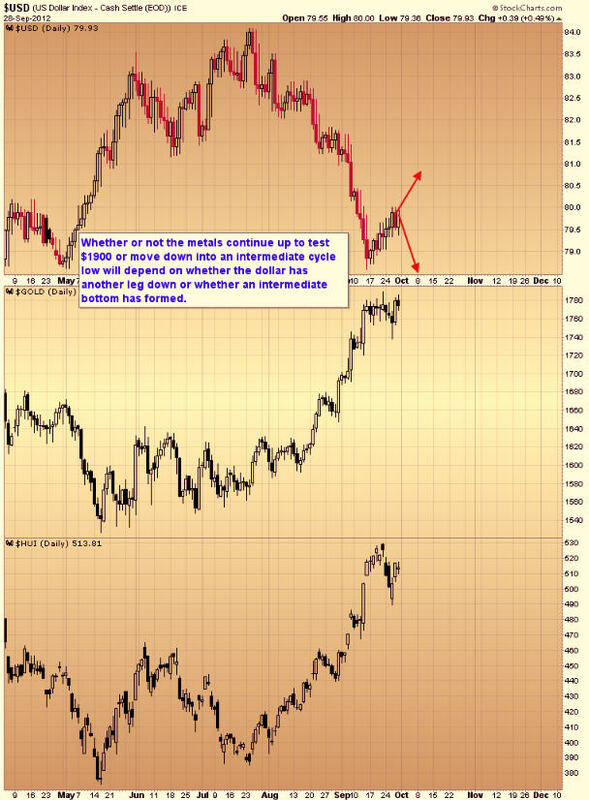 It's been my opinion that the three year cycle in the dollar topped at that point, and should drift generally lower until the next three year cycle low sometime in mid-2014 (with occasional counter trend rallies from time to time). I've been expecting one more leg down in the dollar to test the February intermediate low before the first counter trend rally. However, this bounce is now on the 10th day and in jeopardy of generating a right translated daily cycle (a cycle that rallies longer than half its duration and tends to form higher highs and higher lows). If a right translated daily cycle occurs it will probably signal that an intermediate degree counter trend rally has already begun. 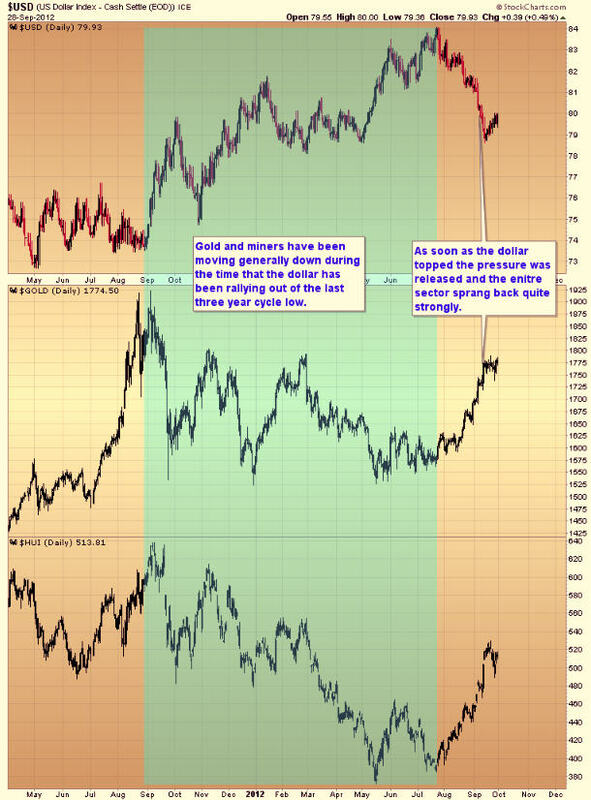 As you can see in the chart above just as soon as the dollar started to rally gold stagnated, mining stocks started to correct, as did the stock market. I find it hard to believe that Bernanke is going to allow the dollar to rise and asset markets correct right in front of an election but the possibility definitely exists if the dollar doesn't turn down early next week. Those of you not willing to hold through a 10-15% correction in miners should probably consider tightening stops, possibly right below Thursday's intraday low. If that stop level gets violated it would start a pattern of lower lows and lower highs which is generally the definition of a down trend. If, on the other hand, Monday morning finds the dollar getting hit hard then I think we may see gold test $1900 before the next intermediate degree correction. In my opinion what happens Monday & Tuesday to the dollar index will probably set the stage for market direction over the next month and into the election.